All children love fantasies full of different shapes and colours. Their imagination knows no bounds and we know how to hear them out. 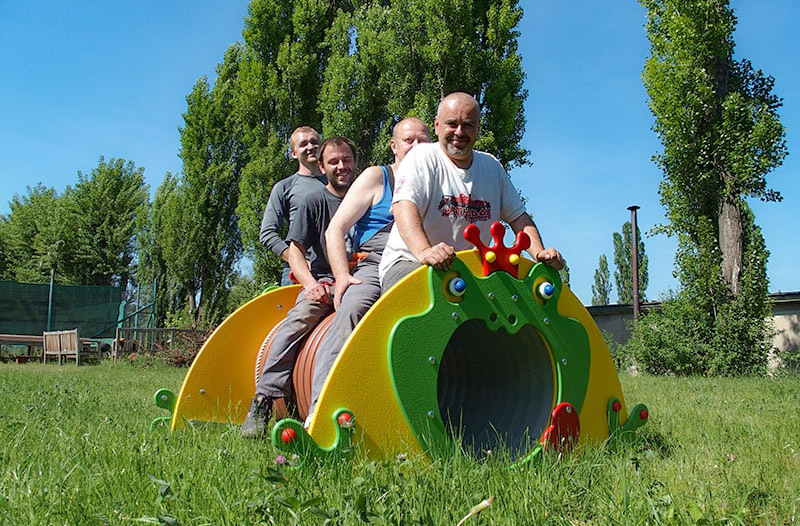 We are a family business that has been producing original playgrounds fitted for cities, villages, companies, and private gardens since 2006. If you get the 8D Playground, you can be certain to find none other like it. We transform our own ideas into reality. We build original jungle gyms, slides, and entire play kingdoms custom-made for you only. 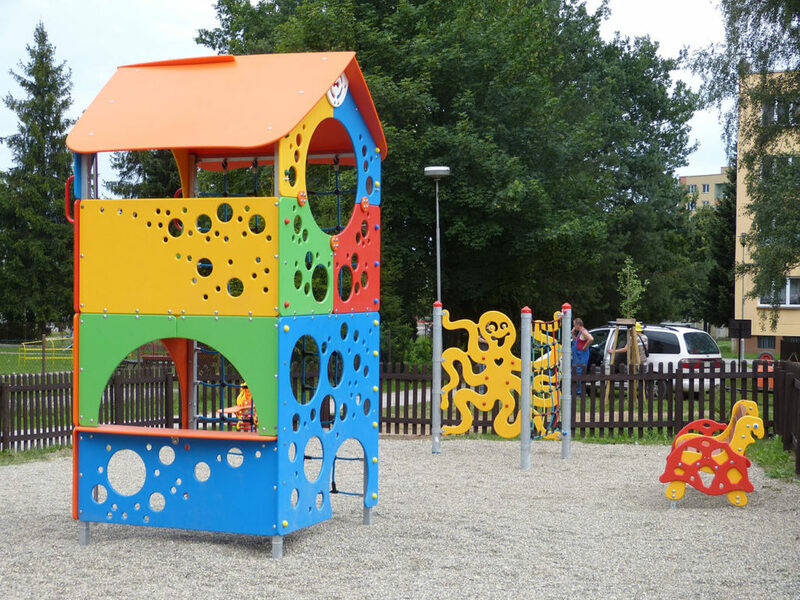 We manufacture most of the playground elements ourselves and you can therefore choose from a large variety of different combinations and extensions. Your children will be over the moon from the new playground that they will get. We work on principles of socially beneficial business. We make efforts to develop children’s personality and also promote their imagination as well as creative and physical activities. And when we’re not in the act of building a playground, we devote ourselves to commonly beneficial projects or lead social and educational programmes. We grow – by broadening our offer of projects and service, amplifying our working team, increasing efficiency of manufacturing and trade, and we expand to offshore markets. We establish The 8D Playground Inc. and reach a turnover of more than twenty six millions crowns. 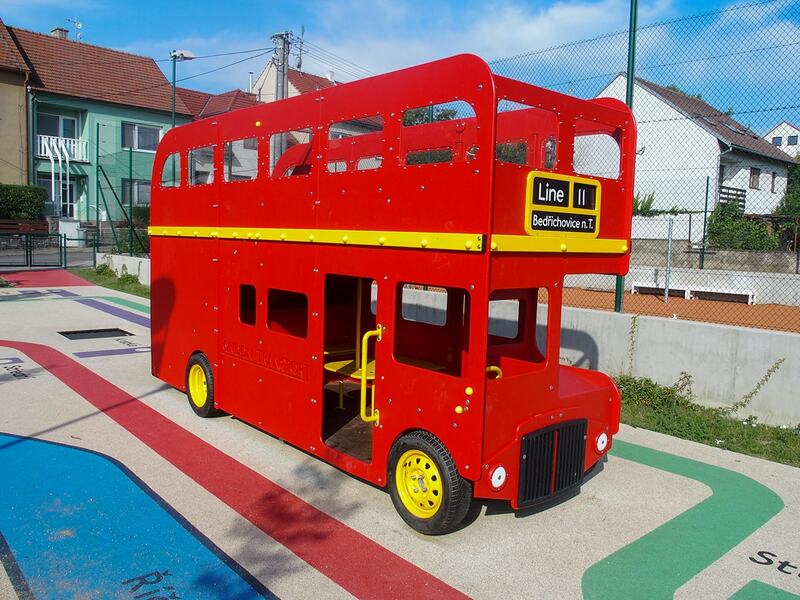 Our company extends the offer of natural playgrounds by adding educational elements. We realize eco-experience gardens. Projects 8D gain an international character. In the matter of manufacturing we cooperate with our partners from many different countries and implement foreign volunteers. 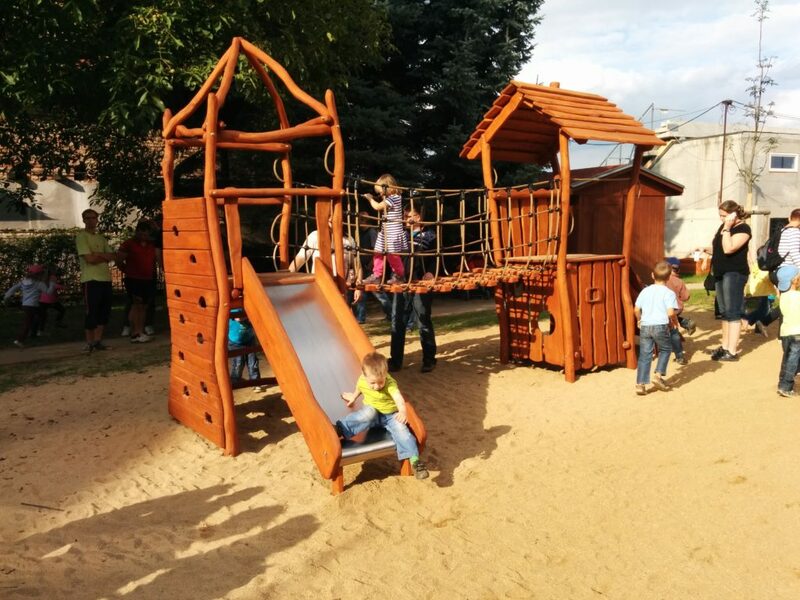 We begin to manufacture playgrounds, increasing profits allow us to realize vaster generally beneficial projects – we set up The 8D Centrum and initiate creative, sports, and educational programs for public audience. 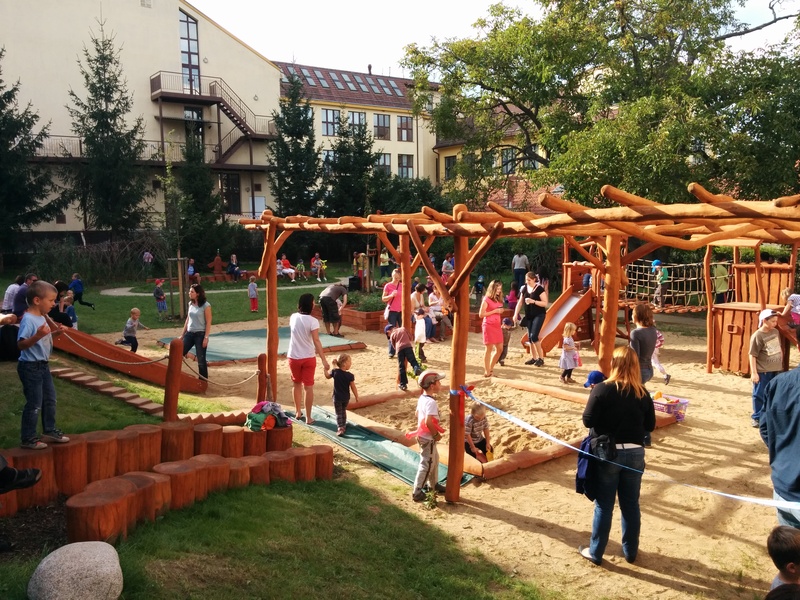 We establish The 8D Playgrounds as a generally beneficial organisation focused on creative, social and environmental projects. The main program is manufacturing playground for disabled people. We originate the first elephant, giraffe and whale for disabled children for free. 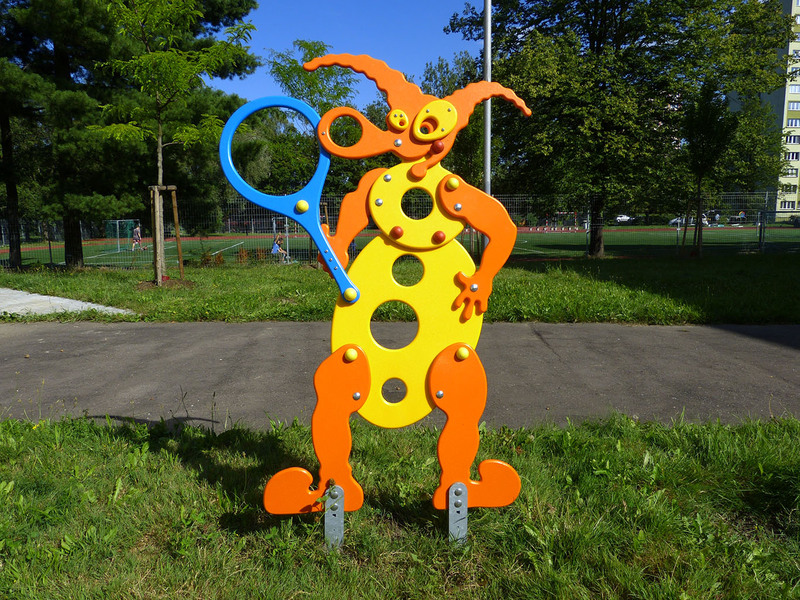 By this act comes into being the foundation of original design and construction of The 8D Playground. The first giant giraffe is manufactured for free with a party of boyscout volunteers. It gives a joy to children from a stationary for disabled. We are parents too and we want the best for children just like you do. We don’t only prioritize their smile but also their safety. 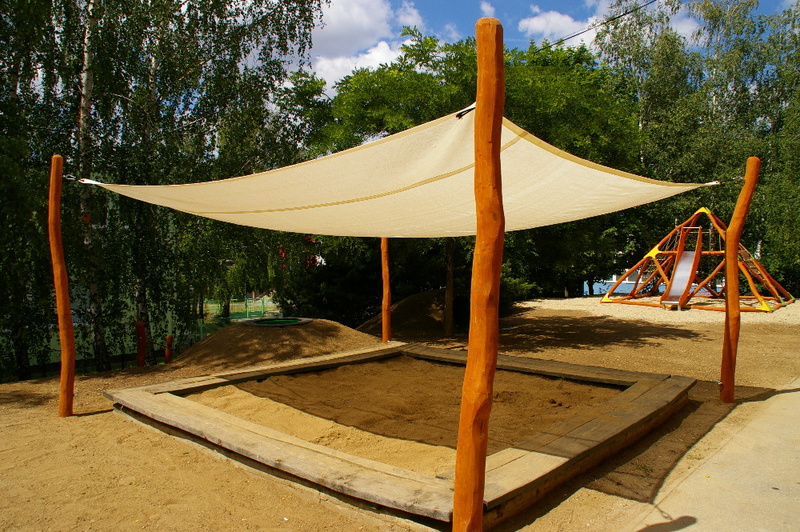 That is why all the materials used on our playgrounds are high-quality, environment-friendly, and completely sanitary. We focus on the precise craftsmanship of our work and think out every slide, climber, and swing to the tiniest detail. We can create any playground you can think of, building a paradise of entertainment for toddlers, pre-schoolers, schoolchildren, and teenagers. We also construct playing fields for disabled children or for seniors, always paying close attention to their specific needs and possibilities. Another thing we can help you with are workout fields and safety surfaces. High-quality, safe, and durable materials matched with professional implementation are our top priority. We closely monitor every stage of production – from the first draft to the last bolt. 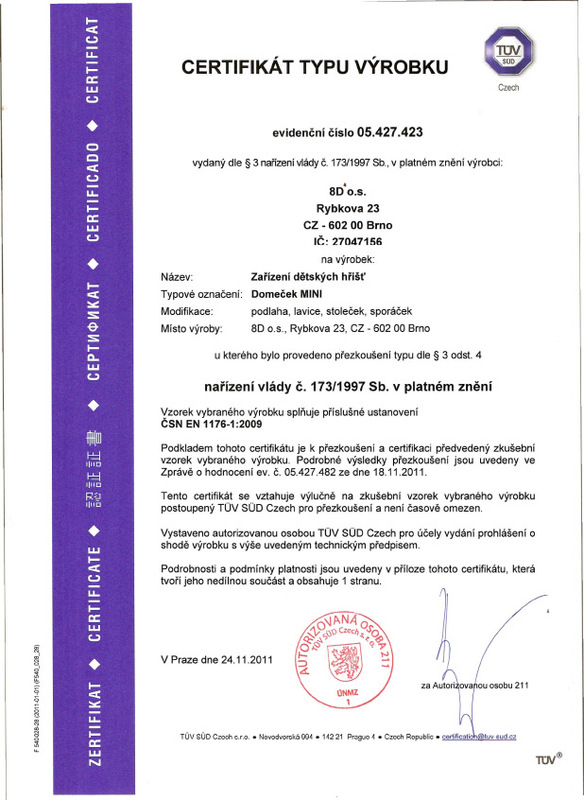 All playground elements are certified according to the ČSN – EN 1176 and 1177 standard. Our playgrounds are completely resistant to wind, rain, snow, and even the greedy hands of vandals. The playgrounds practically don’t require any kind of maintenance and generally last over twenty years of everyday service. Above that, we design the playgrounds with a high load capacity so they could carry virtually anyone. We design all joints and other product details to fulfil their purpose and at the same time, to be safe enough for both children and adults to use. Each edge is safely rounded, flat surfaces do not hold water, and the proportions of playgrounds are always adapted to age. 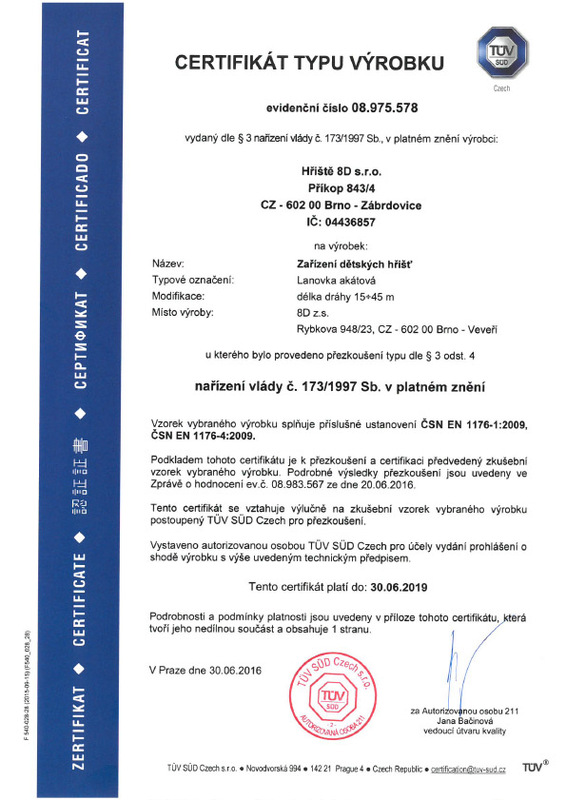 Thanks to the high-quality materials and thorough Czech manufactory, we are able to provide above-standard warranties, uncommon even on a global scale. You gain up to ten years’ worth of guarantee on HD-PE polyethylene playground elements with us. 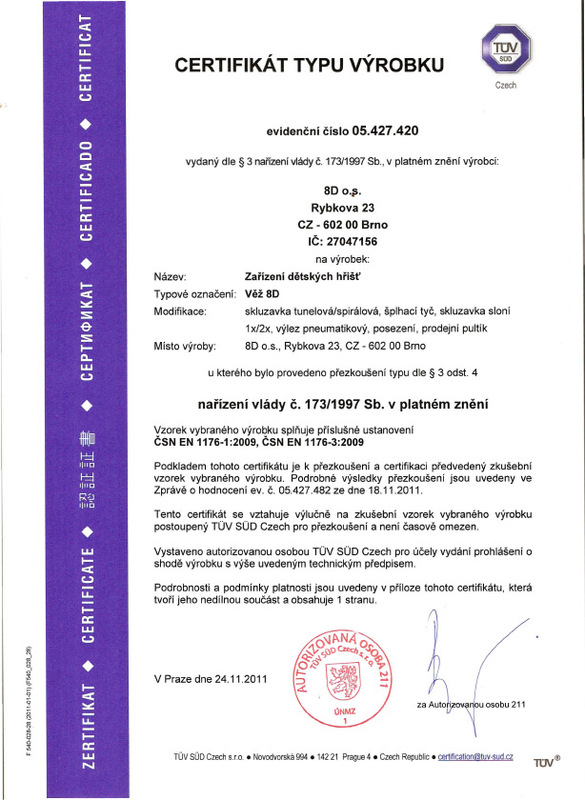 If another supplier offers you a warranty in only units of years, be careful. Quality material will last much longer. 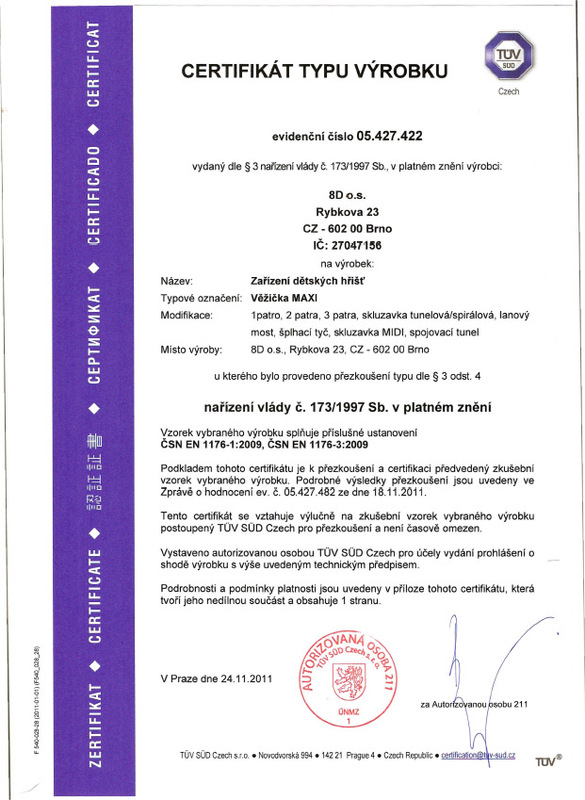 Above that, we provide service even after your warranty has already expired. The idea of what your playground looks like came directly from our brains. That is why you simply cannot find such an original-looking playground anywhere else. We have a variety of product lines at our disposal. We are the only ones on the market able to transform your garden into an African safari, to build a park full of dinosaurs or to put an alien spaceship on your lawn. We invent a fantasy world, travelling to exotic countries to drawn inspiration from them. Then we transform our ideas into reality your children can reach themselves. Another advantage of the 8D Playground is without a doubt its unmatched economic convenience. 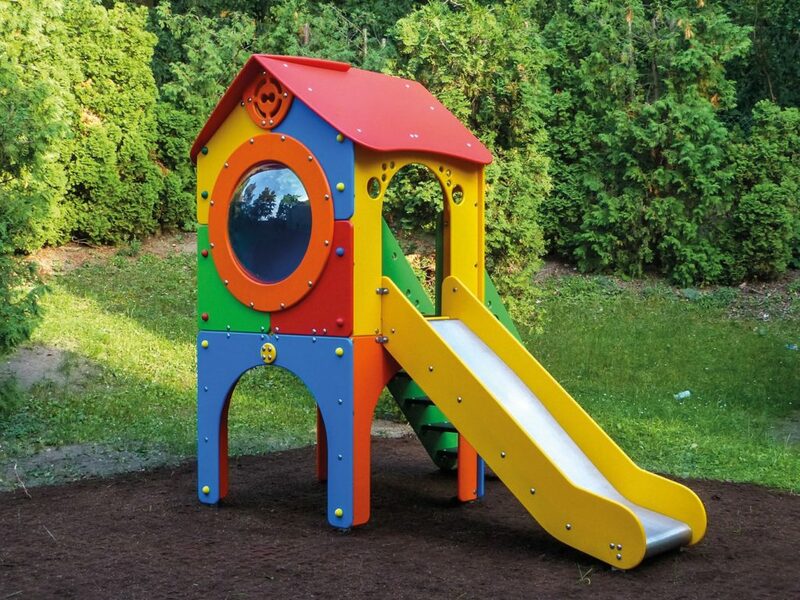 In comparison with cheap versions of playgrounds and materials used, our acquisition price is different but the product quality and the warranty we provide is incomparably higher. 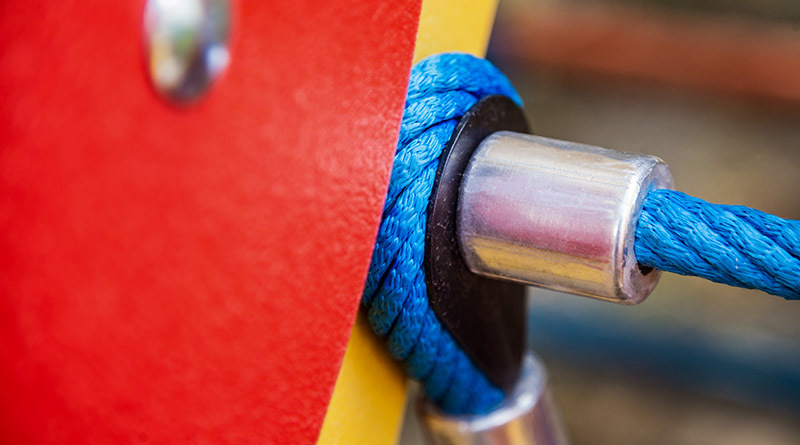 If you purchase a playground constructed using cheaper materials, you should expect another necessary maintenance costs, upcoming repairs, and eventual component replacements in the horizon of the next ten years. It is hard to imagine what the playground would look like in a few more. With our ten-year guarantee and materials that last over twenty years, you will never cross a problem such as those named above and both you and your children will be able to enjoy the playground all the time without any troubles. 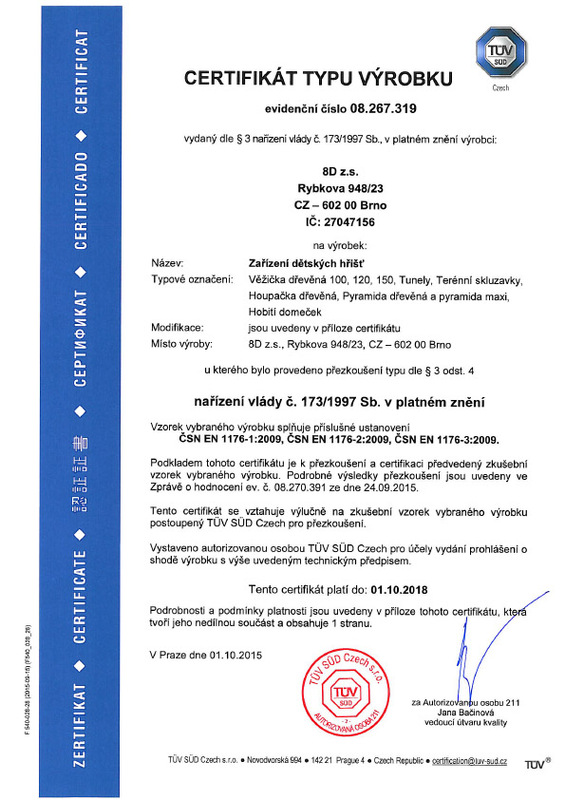 That is why the final price of the 8D Playground is inherently way cheaper and it will spare you tens of thousands of CZK. Quality and safety come hand in hand. We do not supply cheap products of questionable quality. 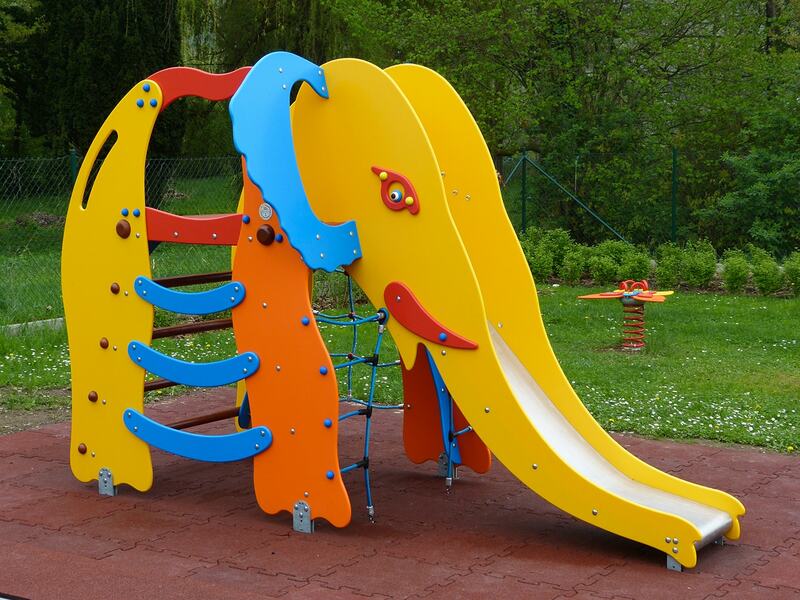 We like to have things under control and so we manufacture all playground elements ourselves or in cooperation with authorized suppliers. That’s why we can always be proud of the quality and thoroughness of our work. 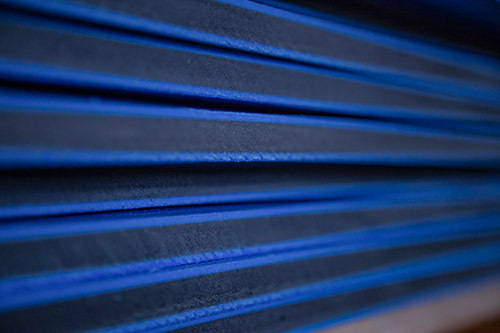 Take a look at the materials the 8D Playground is made of. The construction element base of the maintenance-free playgrounds are homogenous colourful plates of polyethylene. This innovative material has high mechanical strength while it is also safe and physiologically harmless. It is very compact so there is no danger of injuries by splinters. 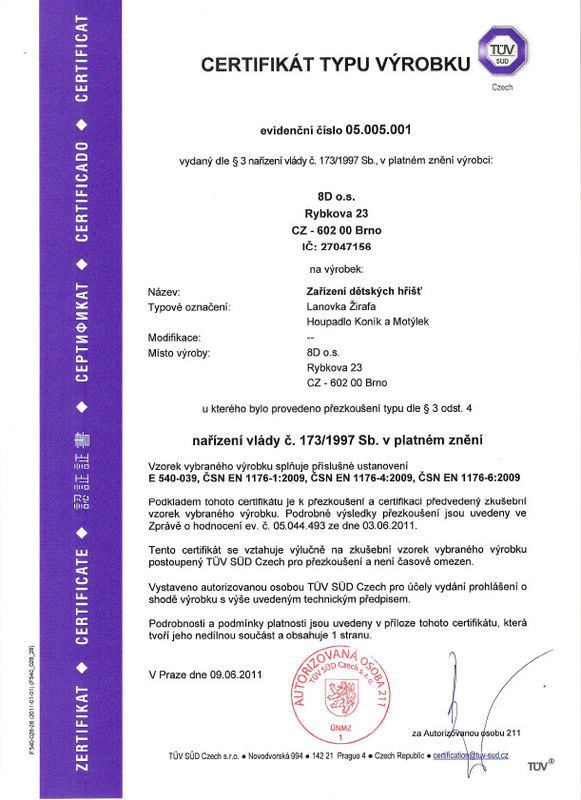 We process the plates by CNC machines and round the edges for children’s safe movement. The material we work with is resistant to chemicals. Bacteria and mould do not cling to it. The panels are not painted on the surface only, the colour goes through all layers of the material – meaning that potential scratches are near to invisible. The colours stay vibrant and stable even after years of direct sunlight. The surface is clean, easy to maintain, and resistant to water and dirt. All these characteristics make the material and construction elements indestructible and extremely durable. 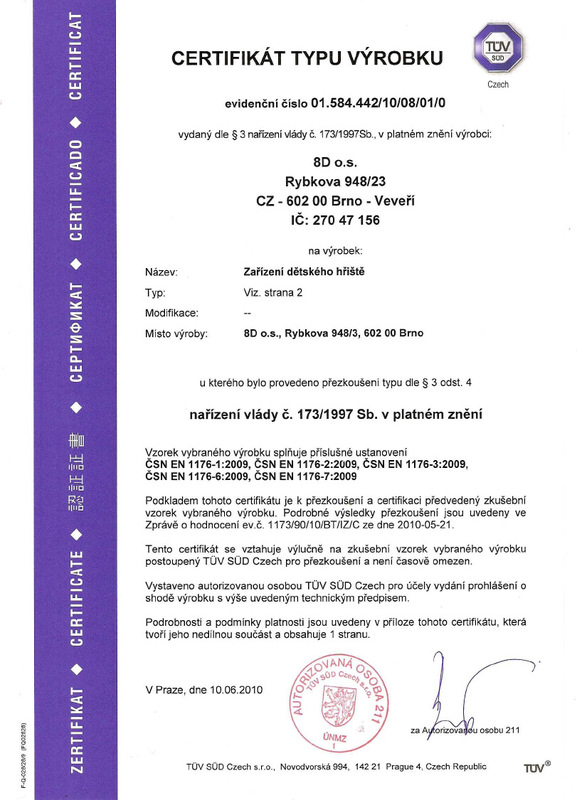 HD-PE polyethylene is also fully recyclable. We are highly interested in recyclable and environment-friendly materials as we pass on production waste to reprocessing. The key material in the manufactory of natural playgrounds is acacia which is the most resilient wood for outdoor use together with oak. The acacia durability is more than forty years. Another thing we use are special oak, larch, and spruce off-centre round logs that possess exquisite mechanical and aesthetical properties. We use stainless steel whenever we need to be certain of the material’s permanent durability and aesthetical quality – slides, handles, railings or connecting elements for instance. 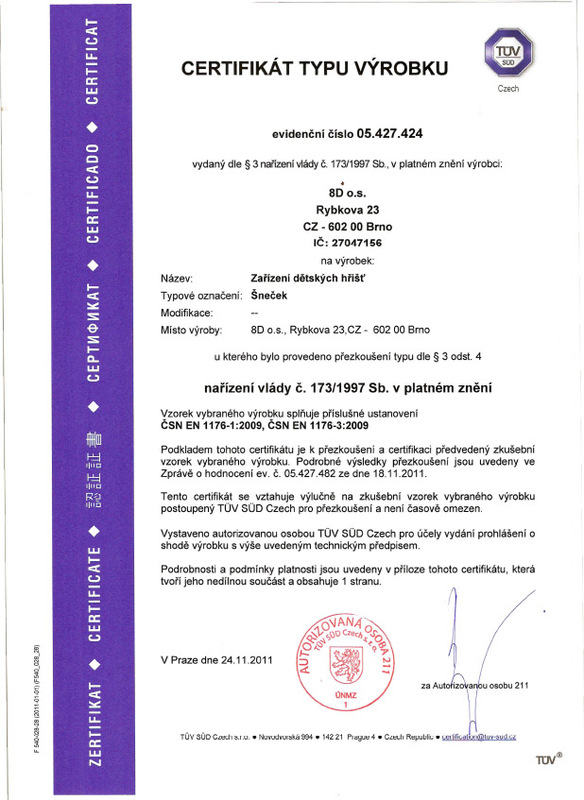 Stainless steel will not peel off or scratch and it is physiologically safe which are all benefits not all materials used in playground constructions possess. We laser cut steel components and externally treat it by hot dip galvanization. 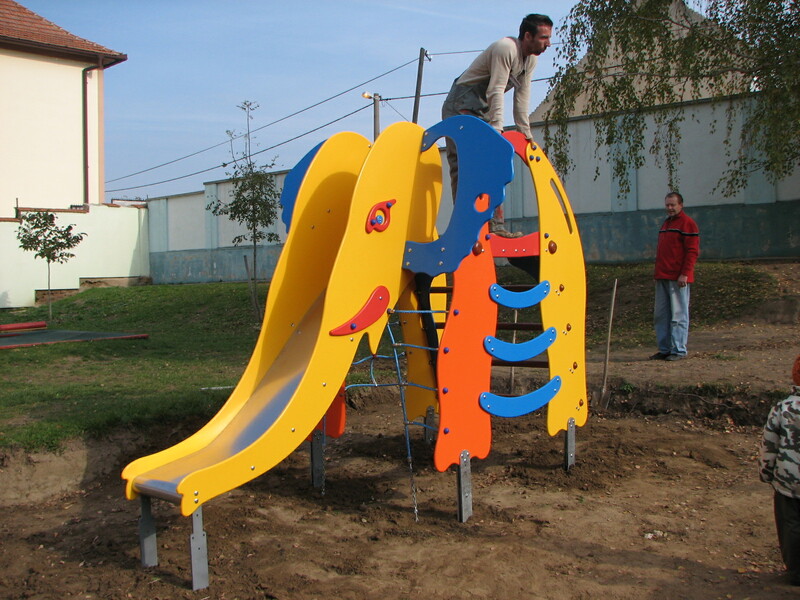 This process secures both long endurance and safety of the playground elements. We use it for base heels, supporting columns, and chains. Fasteners are hot dip galvanized and nuts have a self-lock ring preventing release. 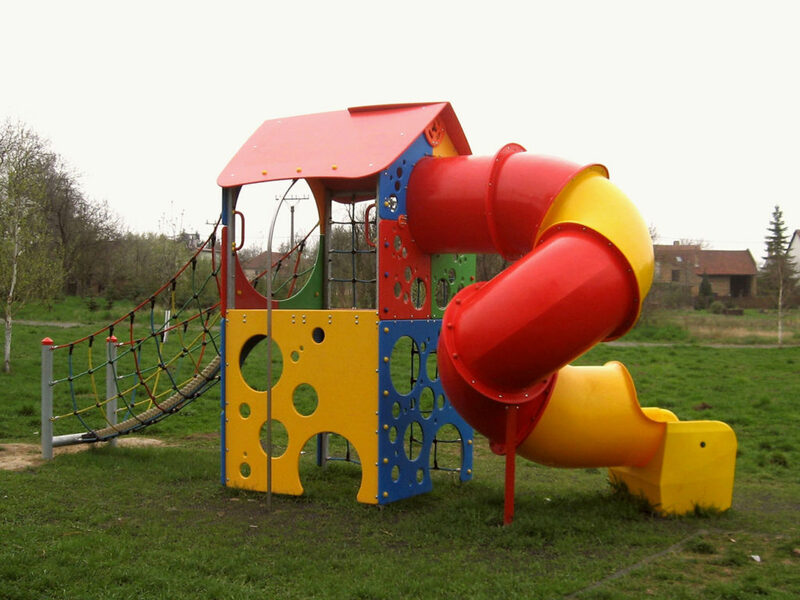 The floors and stairs of maintenance-free playgrounds are made of high pressure laminate, HPL material for short. It excels at endurance, offers a large variety of decors and structures, and belongs to materials having the best price to performance ratio in the construction area. 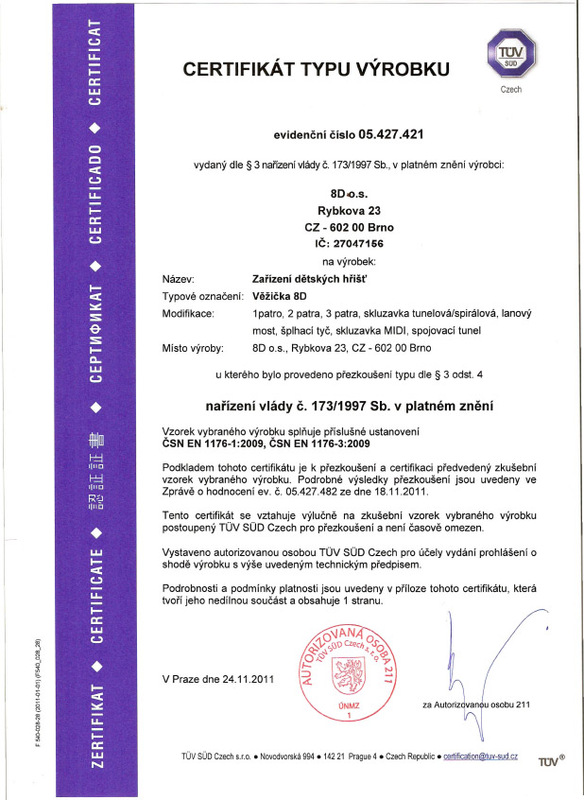 We use compact HPL plates suitable for exteriors. These plates resist abrasion and puncture, high temperatures, and water. They also ensure the colour permanence. Special thick plywood boards made of Finnish birch are glued by waterproof adhesive in a cross pattern out of several layers of quality veneer. This way of gluing fibre ensures high firmness and durability. The boards do not split, crack or make splinters. We use plywood for strained floors, platforms, and stairs. The paints, varnishes, and stains we use are highly environment-friendly. 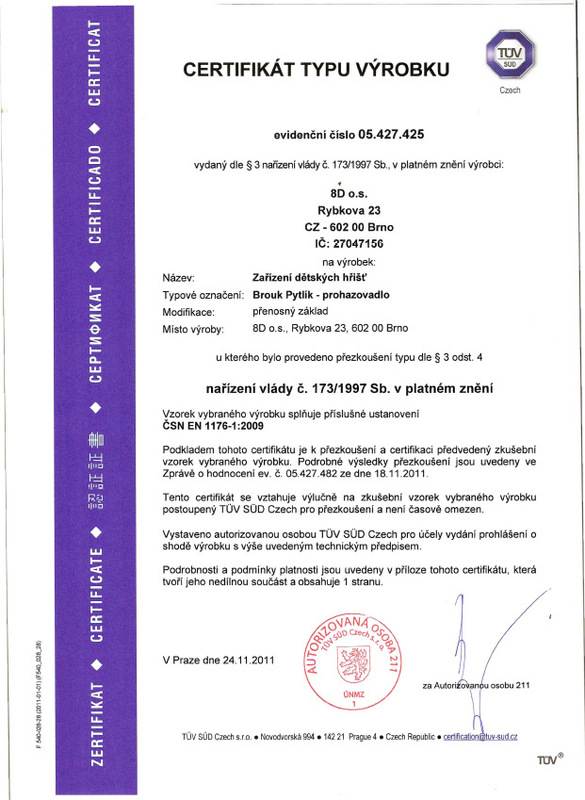 They fulfil the EN 71 standard for indirect contact with food and usage on children’s toys. We use them for natural playgrounds. Our paints are resistant to extreme weather conditions, UV radiation, and wearing down. That is why the playgrounds still look as good as new even after a long time of using.